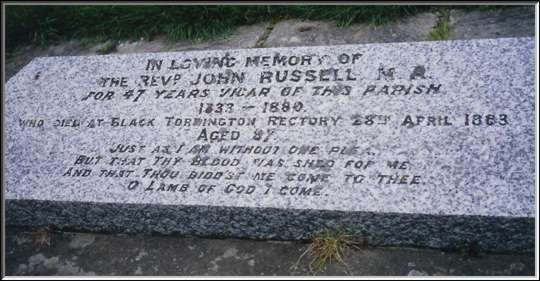 The Reverand John Russell and the Devonshire area of England is where it all began for those of us who are drawn together by this little white working terrier. The Sporting Parson (1795-1883), as he was often called, made his vocation in the clergy, but his lifelong passion was fox hunting. He developed his own strain of Fox Terriers to bolt the fox unharmed from his den when the hounds ran the fox to ground so that the mounted hunt could continue the chase of the wiley red. Russell was true to his philosophy that this earth working terrier should never lay a tooth on the fox. Russell's terrier were flexible of body, spannable of chest and able to easily fit in and navigate the intricate tunnels where the fox took refuge from the hounds. It is the Rev. John Russell's strain of Fox Terrier that we, today, call the Parson Russell Terrier, and it is the Parson's own philosophy that those of us who honor that great man and his fox working terriers ascribe to in our breeding, showing and working program. This view of the Exmoor is typical of that countryside in the Rev. Russell's own hunt territory. The rolling hills and green fields are home to the Exmoor hunt, one of England's oldest and most traditional fox hunts. 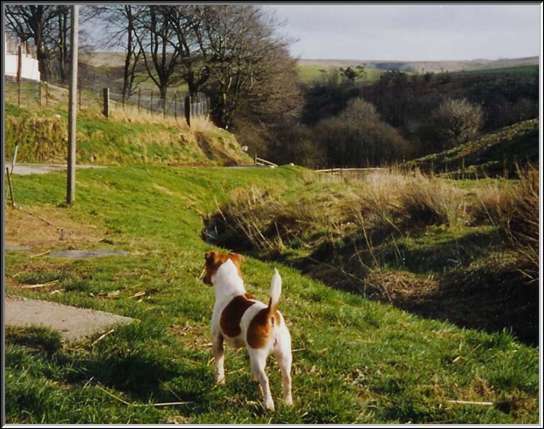 The terrier in the photo is one of the fox hunting terriers at the Exmoor. She is under 12" and one of the terrier man's best workers. The Exmoor countryside, where the Rev. John Russell hunted, requires a terrier smaller smaller in height and chest to successfully fit through the tight earths where the foxes den. The heather is extremely thick and many times a pack of hounds run them to ground in the brambles. It requires a small package to get the job done. This particular terrier has the structure to represent the breed well in the show ring, and has accounted for bolting more foxes in her life than the Master of the hunt can count, and all without one scar to her head or ears. Even in this photo with her tail to the camera you can see her straight, parallel hocks perpendicular to the ground, her substance with plenty of bone but not at all coarse, her good length of neck and her straight, waterproof jacket--a traditional working terrier of the proper size and structure to work in the earth. You are cordially invited to take a brief tour through England's hunt country to meet some of England's finest working terriermen, photos from actual hunts, the country's magnificient country side and a few weekends of open terrier shows. I hope you enjoy it just a fraction as much as I did. There is no substitute for actually being there, but perhaps these scenes will wet your appetite, and you'll find yourself with a new passport, England bound.